That's right theatre fans. 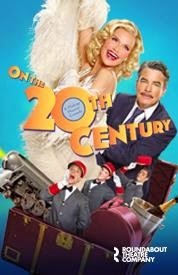 The old-fashioned Broadway musical comedy is no longer a thing of the past thanks to the new Broadway revival of On The Twentieth Century. The show which first premiered on Broadway in 1978 opened to rave reviews last month at the American Airlines Theatre on Broadway. As of now the show is scheduled to close on July 5 but I have a strong feeling it will extend or even possibly transfer to another theatre. I mean why close a hit show if you don't have too right? Now my experience with the show goes back a ways. I first discovered the show in college when a number of my classmates began performing songs from the show in class. At the time I had never heard of the show or knew anything about it. I just knew I liked it. Cut to a dozen or so years later and I was hired as an usher at the same American Airlines Theatre. Imagine my surprise when the first show I worked on was Twentieth Century which was the play version of what would later become the musical that is now taking Broadway by storm. Now here we are over eleven years later and I got the chance to finally see the show that I had admired for years. What a great night in the theatre. Kristin Chenoweth was born to play Lily Garland and Peter Gallagher is fantastic as her former lover Oscar Jaffe. Rounding out the cast are Tony winners Michael McGrath. Mary Louise Wilson, Tony nominee Andy Karl and Mark-Linn Baker. Oh and did I mention that the show is directed by six-time Tony nominee Scott Ellis (The Elephant Man, You Can't Take It With You) and choreographed by Tony winner Warren Carlyle (After Midnight)? Now you see why the show is such a big hit? By the way for those of you who want tickets to see On The Twentieth Century you have come to the right place my friends. We sell it. Plus having worked at the theatre I can assure you that there is not a bad seat in the house. So what are you waiting for people? Musicals like these don't come around every day you know. Don't miss your chance to see Broadway at it's best. Get your tickets to see On The Twentieth Century on Broadway at the American Airlines Theatre. You will love it. I know I did. Until next time theatre fans.